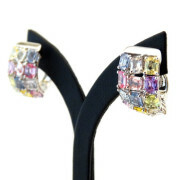 A pair 18ct white gold multi coloured Sapphire set earrings with post/clip fittings. The design of these stunning earrings consist of a rectangular shape composed of emerald cut sapphires claw set in an uneven patchwork pattern. 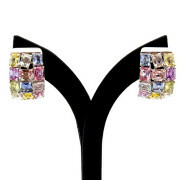 The colours featured amoung the Sapphires include pink, blue, purple, yellow, white and green. Gorgeous.